EPIC JOURNEY: SOTU Reax: Meh! 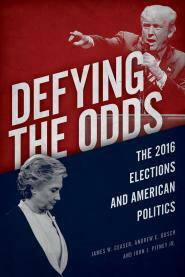 In Defying the Odds, we discuss attitudes toward Trump in the 2016 race. Almost half of Americans who watched President Donald Trump's first State of the Union address -- 48% -- say they had a "very positive" impression of the speech, down from 57% of speech-watchers after his first address to match Barack Obama's rating after his first State of the Union address, according to a new CNN poll conducted by SSRS. It's the lowest net positive rating for a State of the Union address since at least 1998, when CNN first asked the question. There is no equivalent poll for addresses before 1998. Some important caveats: This survey reflects the views of only those who watched the speech, not of all Americans. The poll was conducted among a group of Americans who said in prior interviews that they planned to watch the speech and were willing to be contacted after its conclusion. People who choose to watch a political speech tend to be more supportive of the speaker than the general population; this sample was about 7 points more Republican than the entire American population.